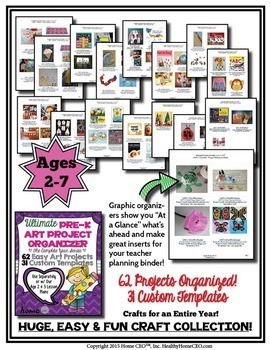 Organize 60+ crafts for ages 2-7 with these craft selections and matching templates. 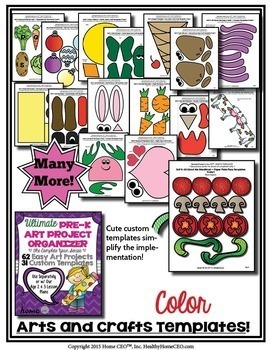 Perfect for homeschool or traditional classrooms, these "At a Glance" project organizers help you visually see all the completed projects and the over 80 pages of coordinating templates included, in color and black and white, simplify the implementation for teachers and the younger students. Click the preview button above to see more detail! This collection is enough to do for an entire year! The "At a Glance" pages will help you see everything you need for several weeks in advance and get completely organized.This Complete Year Craft Organizer is also included in our Complete Year Age 2-3 Preschool Curriculum Bundle. I hope you enjoy this as much as we have! Have a blessed day! 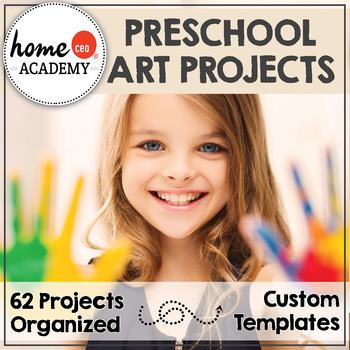 Be sure to follow Home CEO Homeschool Preschool on Facebook for exclusive FREEBIES and product notices (50% off for the first 48 hours)! In some places, this document uses graphics from Whimsy Clips by Laura Strickland, Creative Clips by Krista Wallden, and Graphics from the Pond http://fromthepond.com.au. Additionally, I used fonts by KG Fonts and Pablo Impallari. I also used digital paper from Graphics from the Pond http://fromthepond.com.au and Erin Bradley Designs for my title pages. The ornament images, pizza images and all templates, except where noted in the document, are my own humble creations!